The traditional definition of a gemstone is a mineral that is fine enough to be cut and polished and used in jewelry. But in fact not all gemstones are minerals, and the exceptions are fascinating enough to deserve a study of their own. A mineral is a naturally occurring inorganic solid, with a well-defined chemical composition and a distinctive crystalline structure. Quartz, for example, is silicon dioxide by composition and belongs to the trigonal crystal system. The gemstones that are not minerals fall into two groups. One group includes materials with an organic origin; the other includes inorganic materials that lack a crystalline structure. The group of organic gems is a small one, but it includes some materials that have been very important to the gem trade, such as pearl, coral, amber, ivory and jet. Some of these are only rarely found in the contemporary market. Jet, a type of bituminous coal that takes a good polish, was popular in the Victorian era for mourning jewelry, but is long out of fashion. Ivory, from elephant tusks and the teeth of large mammals, was once popular for carving. But trade in ivory is now strictly controlled due to declining wildlife populations. Trade in coral is also restricted in order to protect coral reefs around the world. There is still a large trade in amber, a type of fossilized pine tree resin that is found mainly in the Baltic. Pearl is historically the most important of the organic gems. Pearls form naturally (or are cultivated) in bivalve mollusks of the oyster type. One of the unique features of pearls in that they do not require any cutting or polishing -- pear is the only gemstone that displays its full luster in its completely natural state. The inorganic non-crystalline gems are referred to as mineraloids because they are mineral-like but with no crystallinity. 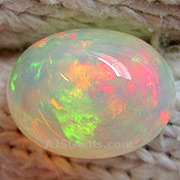 The most important of these is opal, which is a hydrated silica material. Though opal is not crystalline, it does have an interesting internal structure -- it is composed of microscopic (150 to 300 nm) silica spheres that are closely packed in a hexagonal or cubic lattice. These ordered silica spheres produce the distinctive play of color by causing the interference and diffraction of light passing through the opal's microstructure. The other mineraloids used as gemstones are some of the natural glasses, such as obsidian and moldavite. Obsidian is a volcanic glass formed when certain lavas cool rapidly with no crystal growth. Moldavite is also formed from the rapid cooling of molten material, but in this case the molten material is believed to be the result of meteorite impacts. The natural glasses are mainly silicon dioxide, but because they lack a crystal structure, they are not as hard as quartz, typically with a hardness rating of about 5.5 on the Mohs scale.